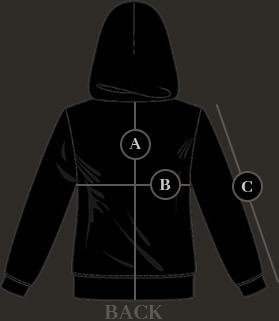 'Amen' Behemoth hooded sweatshirt with zip and pockets. Print on both sides and sleeves. How long does it take to restock the hoodies? The hoodie is back in stock now. When are you going to Restock - BEHEMOTH 'AMEN' SWEATSHIRT WITH ZIP ? They have been out of stock for ages. Best hoodie i‘v Ever bought. So warm and high quality. Very fast shipping as well! This sweatshirt is perfection! The quality of the fabric is great & is very thick and warm. The details in the design ( even on the zipper!) look amazing as well ! would definitely recommend this product ! The quality is incredible - much better than your average sweatshirt! Very thick (warm!) and soft, and print is very high quality as well. Definitely my new favorite! This Sweatshirt with zip is great! It looks great. The quality of this product is awesome! It was my first time I ordered here. The delivery was fast (to Germany). I recommend this product!